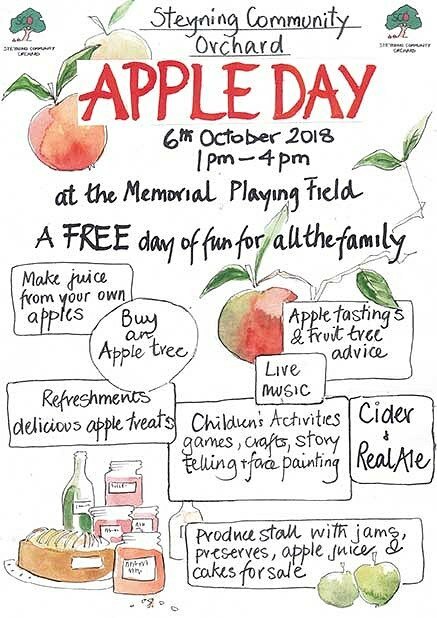 We do hope you will come and share our Fifth Apple Day, which gets larger each year, on October 6th on the Memorial Playing Field from 13:00 to 16:00. Bring along your apples, windfalls and picked, to make them into juice; 50% eating and 50% cooking apples makes the best and most delicious juice you could ever imagine. We will provide plastic bottles. If you bring your own there will be no charge though a donation to the SCO would be appreciated as it will go towards our other activities over the year. There will be two juicing stations, young children love getting involved with the cleaning and cutting up of their apples prior to juicing them. If you bring the apples along already washed so much the better. Our Refreshment Tent will be selling local produce with an apply bias: tarts, cakes and flans and if you felt inclined, a donation for the stall would be received gratefully as it is another fund raiser for us. This year we are hoping to sell some savoury tarts/pizza slices as they were requested last year. There will be cider and beer on sale by Riverside Breweries to smooth the afternoon! Ronnie Reed will be running children activities and Face Painting will also be there. We have been lucky enough to engage, The Wood Shedders,The Cheer up Molly's and The Nick Bullen Gang again so there will be wonderful music to listen to all through the afternoon. Simon Zec will be keeping us all up to speed letting you know what is going on and where. Who is needed, what is needed and who is lost! The SCO has begun to develop a new orchard adjacent to the Big Picnic Field in partnership with the SDS. So far we have planted 8 trees and plan to plant a further 4 over the coming winter. We already have 3 donors and are looking for the fourth. If you are interested in being this person please contact us through our Web Site or approach one of the us on the day. Don't forget: SCO APPLE DAY 6th October Memorial Playing Field 13:00 to 16:00 - Part of the Annual National Apple Day celebration.